Recently, I wrote a blog post for the Ibuildings blog titled “PHP Rated Top Scripting Language by Evans Data Corp“. In it, I discuss the various aspects of a report published about Dynamic Languages. Overall, PHP came out the top rated language, however, in community, PHP ranked second. By their own admission, this was a subjective and not objective measurement. Community is a bit more subjective. For example, the Ruby community is quite small but also very dedicated and vocal. 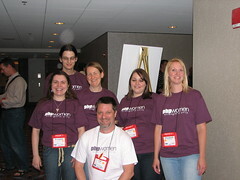 Ever wonder where you could get one of those cool PHPWomen T-Shirts? Well now you don’t have to travel to a conference just to get one. Now you can order your very own from their new PHPWomen T-Shirt Shop. They have a variety of styles and colors including one just for guys to show their support for the organization.